This class is for YOU! 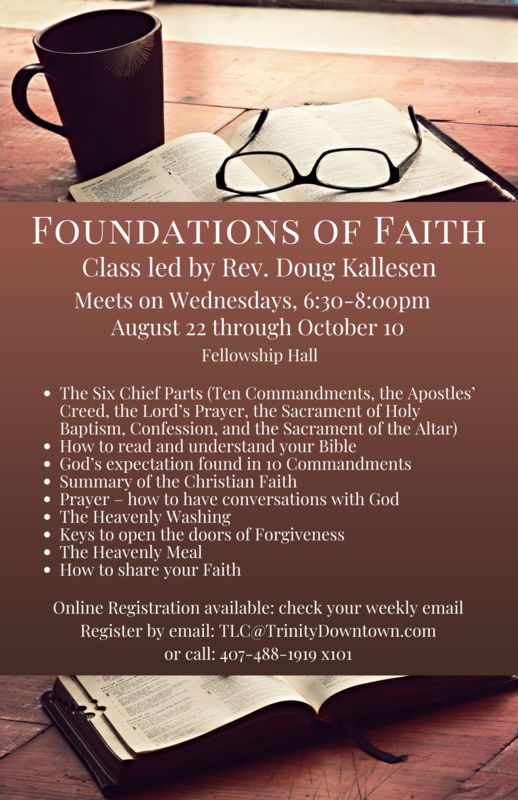 For all those interested in learning more about the Christian Faith and the Lutheran Church, for those considering church membership at Trinity Downtown, for all new full-time staff at Trinity, and for current members who would enjoy a class about the foundations of faith, please mark your calendars! Meet some new people in the Trinity family, spend some time in great discussions, enjoy some refreshments! These classes are always a lot of fun! Trinity’s Senior Pastor, Doug Kallesen, will lead the class and discussion. We will meet on Wednesday evenings from 6:30-8:00pm from August 22 through October 10, in Fellowship Hall. Feel free to extend this invitation to anyone else you think might be interested in participating – these are open to anyone! Questions or concerns? Contact us at 407-488-1919 x101 and TLC@TrinityDowntown.com.